Protests turned deadly this Past weekend in Egypt, but President Sisi doesn’t have to care. Protests Turned Deadly This Weekend in Egypt. President Sisi Doesn’t Really Have to Care. 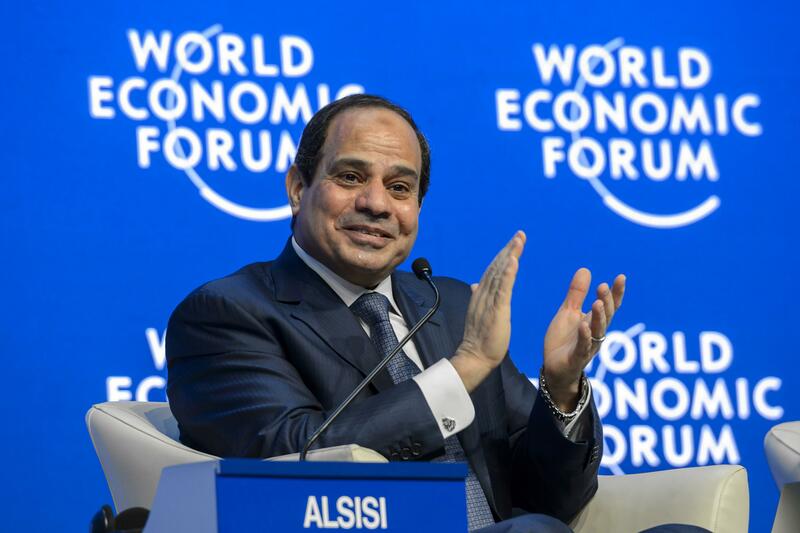 If you’re happy and you know it, clap your hands: Sisi in Davos. At least 17 people were killed over the weekend in protests throughout Egypt marking the four-year anniversary of the uprising that overthrew President Hosni Mubarak. And 516 supporters of the Muslim Brotherhood were also arrested. The killing of one of the unarmed protesters, 31-year-old Shaimaa al-Sabbagh, prompted a rare critical op-ed from Egypt’s most important state newspaper, Al-Ahram, which laid responsibility for her shooting by masked policeman at the hands of President Abdel Fattah al-Sisi. But if the violence and the public anger it provoked have Egypt’s leaders concerned, they’re not showing it. Today Mubarak’s sons, who were widely criticized for their accumulation of wealth prior to his overthrow, were released on bail pending retrial on corruption charges. Mubarak himself remains confined in a military hospital, though the grounds for that are unclear given that all the charges against him were dropped in November. Sisi certainly hasn’t been acting like a leader in crisis. Last week he was in Davos calling for Muslims to reform their religious discourse. This week he’s heading to Addis Ababa for regional talks about water rights, a critical issue for the Egyptian economy but not exactly at the forefront of public debate right now. More good news for Sisi: Given the post-revolutionary turmoil in Syria, Yemen, and Libya, it seems unlikely that the U.S. will put too much pressure on him beyond some cursory statements on the importance of human rights. Last summer the U.S. resumed the military aid that had been frozen after Morsi’s ouster. Other Western governments followed suit: Even as Canada has pushed for the release of the Canadian-Egyptian Al Jazeera journalist Mohamed Fahmy, it’s also signed on to a new program to train Egyptian police. Though this past weekend’s violence is rocking parts of Egypt, it is unlikely to get to Sisi. He’s no doubt studied the mistakes of Mubarak, who allowed protests to get out of hand and at a critical moment lost the support of both his own generals and his international backers. At least for the moment, Sisi seems unlikely to make the same errors.